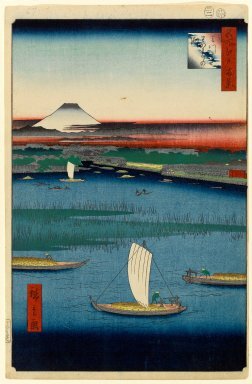 This scene looks at the widest stretch of the Sumida River, with a most striking view of Mount Fuji, with black peak and white skirt. This point is where the Sumida River divides in the fork (Mitsumata) between the main channel, which flows under the Eitai Bridge (not visible here) into Edo Bay and the Hakozaki Canal, in the center distance, flowing under the Eikyu Bridge. The island to the left was occupied by daimyo mansions for reasons of defense. "Wakarenofuchi" (dividing pool) is the place where the tide water and fresh water parted in this shallow flat near the mouth of the river. In the past there were teahouses (where the boats and reeds are in this view), in an area known as Nakazu, which thrived until 1789 when it was destroyed by the reformist regime of Matsudaira Sadanobu, as a crackdown on immorality. Today Nakazu is a tract between Kiyosu Bridge and the elevated highway which has replaced the Hakozaki Canal.